Stay on trend while creating precise pours with this TableTop King ACJ4 1 oz. & 1.5 oz. antique copper jigger! From cosmos to Manhattans, equipping your bartenders to create perfect pours ensures consistent, high-quality drinks every time. Plus, having the exact proportion on hand means you'll cut down on costly over-pouring. This time-saving addition to your bar even reduces the amount of dirty dishes. This jigger includes one side for measuring 1 oz. and another to measure 1.5 oz. 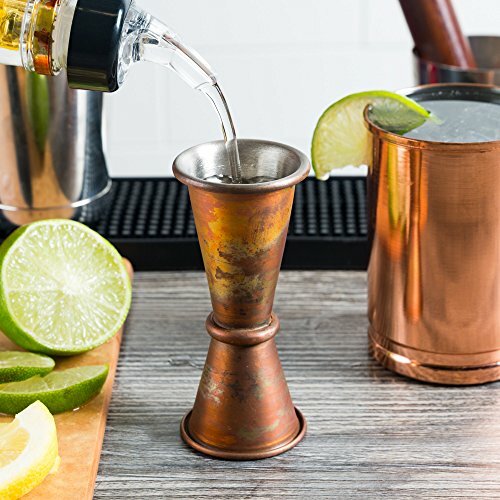 Great for alcohol or syrups, this one-and-done jigger eliminates the need for a second measuring utensil. Simply turn the jigger over to switch between the different capacities while making drinks. If you have any questions about this product by TableTop King, contact us by completing and submitting the form below. If you are looking for a specif part number, please include it with your message.